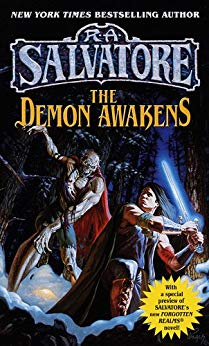 In The Demon Awakens, bestselling author R. A. Salvatore creates an astonishing new world for readers to explore--and an intrepid hero to lead the way: Elbryan Wynden, who must confront the dark tides of destiny in his epic search for justice and peace . . .A great evil has awakened in the land of Corona, a terrible demon determined to spread death and misery. His goblin armies and fearsome giants ravage the settlements of the frontier, and in the small village of Dundallis their merciless attack leaves behind two shattered orphans: Pony and her lifelong friend, the youth Elbryan. Taken in by elves, Elbryan is raised to become a formidable ranger--a fateful role that will lead him into harrowing confrontation.Meanwhile, on a far-off island, a shower of gemstones will fall onto the black sand shores. These heaven-sent stones carry within them an incredible power--the key to all that is good in the world and all that is evil, and it is up to one young monk to liberate them from the corrupt monastery that harvests them. Pray that they don't fall into the wrong, clawed hands . . .